Source: New York’s Areté Venue & Gallery. Come see three of New York’s most adventurous soloists share new material at Arete Tuesday, December 18th. 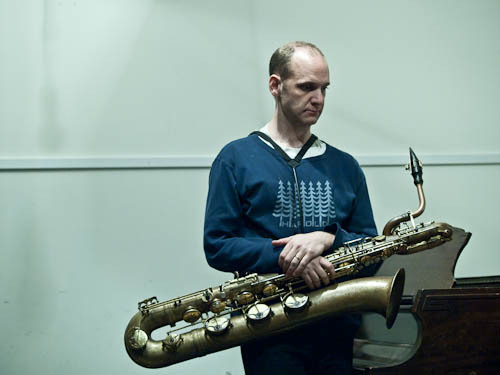 At 7 pm Nate Wooley, trumpeter extrodaniare, will be presenting a new version of Coyote (Brooklyn 2018), while at 8 pm low reeds specialist Josh Sinton will be sharing his new show idbrule (for b.s). Stick around for a 9 pm set, loadbang presents: William Lang, featuring the adventurous quartet’s trombonist in solo works by Dai Fujikura, Thanos Chrysakis, Yu Kuwabara, and Klaus Hubner. $10 per set or $20 for all three. Fay Victor is an improvising vocalist, composer, lyricist and educator riding all the chasms and seams of musics that are improvisational and conversational in nature. Gabriel Zucker is a pianist, composer, and multi-instrumentalist from New York, whose work combines maximalist compositions with the progressive improvisation of New York’s creative music scene. Weighting, Zucker’s fourth studio album and second on ESP-Disk’, is an extended composition inspired by Rachel Kushner’s novel The Flamethrowers. Duo with Toronto avant-garde opera vocalist Fides Krucker and guitarist Tim Motzer. This is a record release and first time performance in the US for this duo. Their forthcoming album is entitled Vanishing and is being released on 1k Recordings. The Techno Love Series is inspired by the euphoric feeling of connecting with a community through music. It is comprised of 30 woven “cocoons” which are pieces of wearable art. This curatorial approach references Cynthia’s desire for her work to remain inclusive to all communities, rather than an untouchable object.